The solid deformation and fluid flow problems can be solved by using the finite element method (FEM) using governing equations for a dualporosity poro-mechanical model found in Zhang (2002) and Zhang and Roegiers (2005). Introducing stress-permeability into the finite element model, permeability variations induced by stress changes can be obtained. A case example is given below to examine permeability changes due to mining. When mining near aquifers, it is of critical importance to determine the changes of permeability due to mining (Zhang and Shen 2004). The coal mine considered here is located in the Yanzhou coalfield, Eastern China. 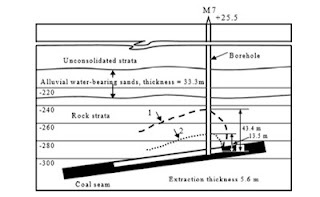 The average mining depth is 305 m and the extraction thickness of the pertinent coal seam is 5 m. A water-bearing sand lies 75 m above the coal horizon, and the thickness of the sand layer is 30 m (Zhang et al. 2001, Zhang and Wang 2006). Figure 8.13 shows the finite element model and mesh of a section perpendicular to the mining direction. In this model, a half of the mining panel is considered due to geometric symmetry. The generalized plane strain model is adopted since the mining direction of the panel is much longer than the direction of the panel width. The model is laterally confined and impermeable. The bottom of the model is considered as a rigid and impermeable boundary. The strata gravity with average unit specific weight of J = 23 kPa/m (or 2.3 sg) is considered as the far-field stress acting on the panel. The far-field stresses and pore pressure are respectively: V v = 7.0 MPa, V H = V h =3.8 MPa, pw= 3.0 MPa. The main parameters of these strata are listed in Table 8.2. In the table most rock parameters are based on laboratory experiments. However, the parameters for the sand aquifer and the mined area are simply estimated. The fracture spacing is assumed to be 1 m for all layers. Figure 8.14 shows the FEM calculated contours of the permeability variations (permeability ratios of post- to pre-mining) in the vertical direction. In this figure, the mining width of the panel is 90 m, and the vertical axis is the central line of the panel. It can be seen that permeability increases in the strata around and beyond the mined area and decreases in some areas near the unmined coal seam. The maximum magnitude of increased permeability lies in the immediate roof and floor of the mined seam of the panel center. However, the maximum height of increased permeability zone appears in the strata over the unmined coal pillar. Figure 8.15 presents the contours of permeability variations in the horizontal direction. The permeability variations are very different from the vertical one shown in Fig. 8.14, due to the different stress distributions between the vertical and horizontal directions. The height of the increased permeability zone in the horizontal direction is higher than that in the vertical direction. Furthermore, there are larger magnitudes of permeability changes in the horizontal direction (refer to Figs. 8.14 and 8.15). It can also be seen that the maximum increased permeability zone occurs over the mining panel center for the horizontal permeability, while it occurs over the coal abutment of the mining panel in case of the vertical permeability. This implies that even if an aquifer is not exactly over the mining panel, water intrusion may still take place. Figure 8.16 gives the field observed results for a long-wall mining face in similar geologic conditions as the numerical model. In order to measure permeability changes due to mining in the overburden strata, observation boreholes were drilled pre- and post-mining. The flowrates or drilling fluid circulation changes along the borehole during drilling were measured and well logs were run (Liu 1999). It can be seen from Fig. 8.16 that the observed increased permeability has a similar shape as the one predicted in Fig. 8.14. Parametric analyses using a finite element model are conducted to study the influences of thickness of extraction, mining width (L in Fig. 8.17), and depth of mining on permeability in the surrounding strata of the coal seam. The straight lines in Fig. 8.17 show that the permeability height increases with mining width and thickness of extraction. Figure 8.17 also compares the FEM results of increased permeability height in the overburden strata with field observed data and empirical formula (Liu et al. 1981). In the observed data, lift mining methods were used for mining thick coal seams found in China. It can be seen that the FEM results are coherent both in magnitude and in trend. Figure 8.18 presents the increased permeability in the overburden strata with mining depth. Field observed height of strata with increased permeability, the FEM calculated result, and the one given by Alejano et al (1999) are compared in Fig. 8.18. The figure shows that as the depth of mining increases, the calculated height of the increased permeability zone decreases, which is coherent with the results given by Alejano et al. (1999). Compared to the observed results from Liu et al. (1981), again coherence is found in magnitude.